Fifi the Circus Poodle Peanuts figurine is about 2 inches tall (5cm), made of PVC plastic and is made by Schleich in 2016. Fifi is a circus lady dog, who performs amazing tricks. Fifi is a stunningly beautiful, white poodle who performs in a circus along with two other poodles. When Snoopy met her for the very first time, he immediately fell head over heels in love. It is no wonder, because she looks simply stunning with her incredible black eyelashes and her pink collar. 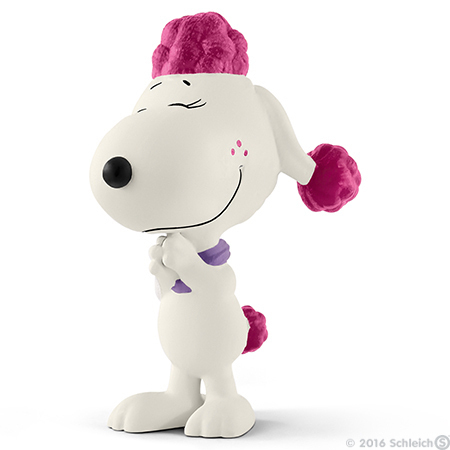 Snoopy will meet her again in the new Peanuts film. What are the two likely to experience together this time?